Improve sales performance, save time and increase productivity with our new sales assistant feature. ZAZ GPS powered by SG Connected Car allows auto dealers sales staff to sort and then search vehicles on the immediate or remote lots. Sales staff can sort by make, model and year. 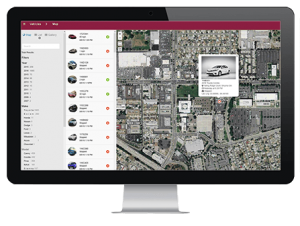 As an example, a sales manager can search a specific make, model, year or color and then instantly locate all vehicles that match that search directly on any of their lots. No more waving a keyfob in the air to find a car. ZAZ improves sales staff professionalism and allow more time for staff to focus on closing sales. Searches can be done at sales desk or from any smartphone. Vehicle location is highlighted on a satellite image map displaying exact location of all matching vehicles. Sales personnel can then go directly to vehicles location with confidence. ZAZ can also be used by service or parts personnel to improve productivity. In today’s competitive auto market, our new sales assistant feature can be a powerful tool that differentiates your dealership from the competition.